“Everybody can’t go pro in football, but everybody can go pro in STEM.” This was said by New York Jets offensive lineman Kelvin Beachum, who, in addition to protecting the blind side of pro quarterbacks, is one of the biggest STEM advocates in the NFL. 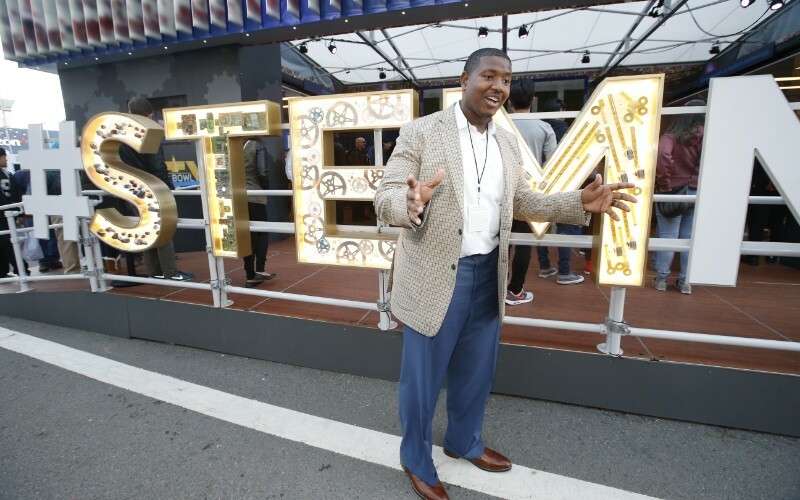 In addition to running The Kelvin Beachum Community Football Camp, Beachum raises awareness for science, technology, engineering, and mathematics by speaking in classrooms and making appearances at events such as the U.S. News STEM Solutions conference. Beachum discusses how he first got into STEM education, his interest in educational events, and how technology has affected pro football in this exclusive interview. Innovation & Tech Today: What initially inspired you to advocate for STEM education? Kelvin Beachum: For me it’s family history, to be honest with you. It goes back all the way to my grandfather. My grandfather has been blind for over seventy years. He’s creeping up on ninety. My dad had to drop out of school in eighth grade to work on cars for the family. And if you look at both of their career paths and what they’ve done today, everything that they’ve done is science, technology, engineering, and math, and they’ve done it on a daily basis. If I were to tell either of them that they do STEM every single day, they would look at me like I’m crazy. So if people in rural America do this on a daily basis and have no idea, what about the people and some of the kids that are growing up in this day and age? What does their exposure look like? What does their awareness look like? I started thinking about ways in which I could impact the world and use this platform. It was bringing it back to what I thought growing up when I worked on cars. But I had no idea I was doing science, technology, engineering, and mathematics every single day. Growing up, I didn’t understand it. Going to college, I got an economics degree. This is the place where I can really be impactful. I’ve seen how the lack of education, the lack of awareness, has stunted growth for many individuals. It’s been a wonderful time and a way to bring not only access, but awareness and exposure. A pipeline to a job and pipeline to a career and lifelong passion. Trying to get the message out to young people and giving them just the opportunity to be able to see that they can do something on a daily basis and that can be their career, that can be a passion. I&T Today: Do you get involved with STEM-related events? Kelvin Beachum: I have my own currently that I do every single year. I have my STEM camp that I do in my hometown. It’ll just be going on year four. I’ve adopted the Barack Obama Male Leadership Academy down in Dallas who I also work with. I sponsor a speaker series, fund college visits, provide programming, and sponsor STEM-related field trips for those students to help provide access and opportunity. I don’t need to recreate the world. I don’t need to go and create my whole entire national program. There are a number of programs and a number of corporations that are always doing great work. For me, it’s coming along and bringing more awareness, bringing some sizzle, because a lot of times you don’t have professional athletes that are there to actually show those kids, “Yes this is cool. This is what you need to be doing.” For me, it’s coming alongside those corporations and those entities that already have those great programs and going and finding ways to add value there. I&T Today: Do you have a favorite type of sports tech you enjoy using during the offseason? Kelvin Beachum: There’s tech we use from a company called WHOOP. It’s a wearable device, I’ve been using it almost two years now. I use it both in the season and during the offseason. It measures everything. It measures biometric data, it measures strains, it measures recovery. You get to see exactly how your body handles the strain you put on it during the day and the recovery during the night. They actually just added another feature this week, which is a weekly assessment. It shows the entire week and how you progressed. They’ve done some super innovative things. You see people from all walks of life, all different types of sports that are able to use the platforms and be able to assess their bodies and be able to make better decisions about how they recover their body, how they train their bodies, how to make their body more efficient. I&T Today: Do you believe that technology has had an overall positive effect on the sport? Kelvin Beachum: I think it has. I think there has been a high quantity of info sharing that’s increased in sports so players understand what is going on with their bodies. How to make their bodies perform at a more efficient state. Even if you look at what’s going on from the digital side. How, digitally, the game has changed now, consumers have been able to consume the game on different devices. But it’s changed a lot and I think it is going to continue to change. I just hope it never comes to a point where they have robots playing football. I don’t want it to get that far.